608 pages | 120 B/W Illus. During the past decades, enormous progress and enhancement of pharmaceutical manufacturing equipment and its use have been made. And while there are support documents, books, articles, and online resources available on the principles of cleaning and associated processing techniques, none of them provides a single database with convenient, ready-to-use training tools. Until now. 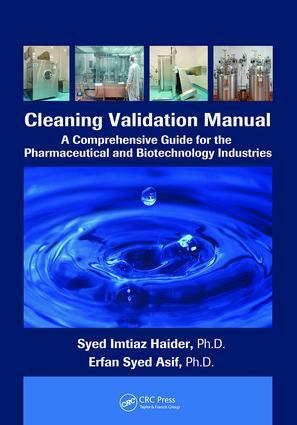 Cleaning Validation Manual: A Comprehensive Guide for the Pharmaceutical and Biotechnology Industries elucidates how to train the man power involved in development, manufacturing, auditing, and validation of bio pharmaceuticals on a pilot scale, leading to scale-up production. With over 20 easy-to-use template protocols for cleaning validation of extensively used equipments, this book provides technical solutions to assist in fulfilling the training needs of finished pharmaceutical manufacturers. Drawing on the authors’ more than two decades of experience in the pharmaceutical and biotech industries, the text offers hands-on training based on current approaches and techniques. The book does not merely provide guidelines or thought processes, rather it gives ready-to-use formulas to develop Master Plan, SOPs, and validation protocols. It includes cleaning procedures for the most commonly used equipment in various manufacturing areas and their sampling points, using a pharmaceutical manufacturing site with both sterile and non-sterile operations as the case facility. It also provides the training guidelines on a CD-ROM to enable users to amend or adopt them as necessary. Grounded in practicality, the book’s applicability and accessibility set it apart. It can be used as a guide for implementing a cleaning validation program on site without the help of external consultants, making it a resource that will not be found collecting dust on a shelf, but rather, referred to again and again. Syed Imtiaz Haider and Erfan Syed Asif are with Gulf Pharmaceutical Industries in the United Arab Emirates.